It's been a very relaxing week here. We spent the days after Christmas lolling around, reading, sledding and just generally taking it easy. 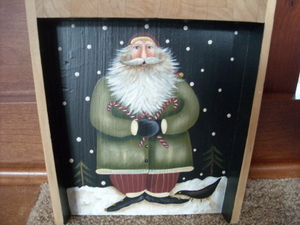 We are getting ready to pack Christmas away, but I have some last few Santas to show you before we do. 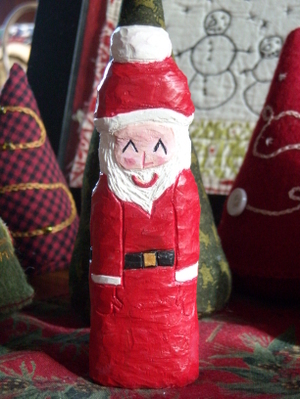 My favorite gift this Christmas is this Santa made by Chloe! She carved it out of maple with a simple pen knife. She got the piece of wood from the garage and was carving in secret. If we'd known I would have recommended a softer wood. Anyway, it's just marvelous and I was so surprised! 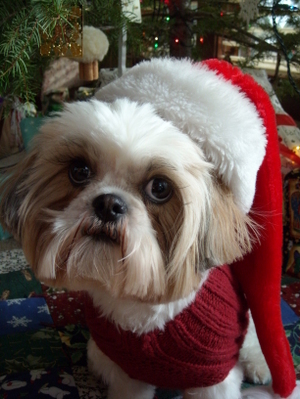 He fits right in with the other Santas. 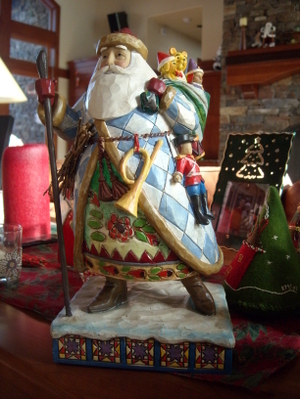 This Santa is a gift from my sister-in-law and is wonderful for the quilt imagery. He looks great with the collection. 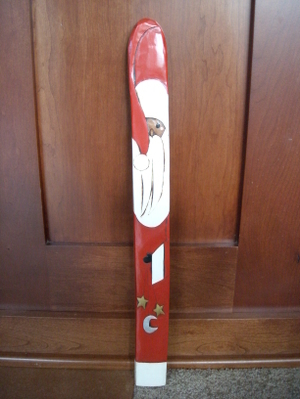 We picked up this tall Santa at a craft fair this fall. We met the artist and found out that these are made from huge cedar logs that wash up on the beach along Puget Sound. The husband carves them and the wife does the painting. 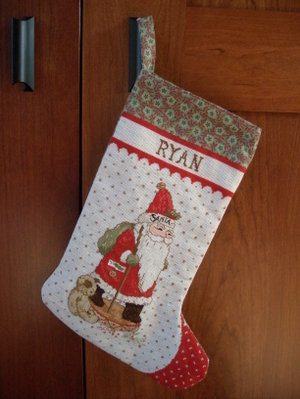 This is my favorite stocking of all the ones we have. I started this for Ryan when I was pregnant, but finished it just in time for his first Christmas. 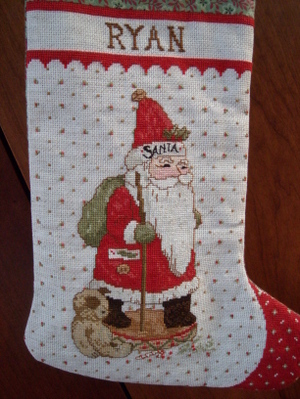 I have many cross stitch Santa and Tomten patterns, but this is the only one I've done. Maybe I ought to make another one. This is another one of my favorite gifts this year. 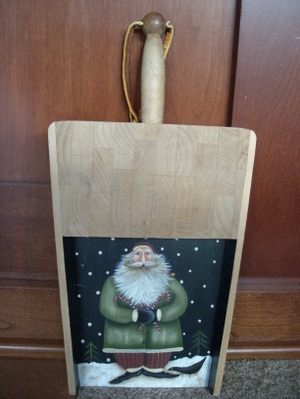 This is a hand painted cheese server that my sister sent me. 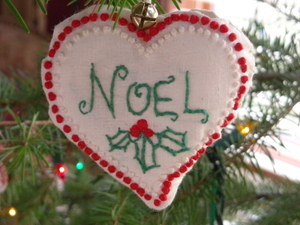 She didn't make it, but she bought it at a tiny shop in the San Bernardino Mountains. My sister went back to the shop after the fires there in October and this shop was still standing while the lumber store next door had burned down! Isn't this guy's beard marvelous? I love it! Tomorrow's a big day for me. I'm having my lumpectomy surgery. I hope to be back here within a few days. Happy New Year! The stockings were hung by the chimney with care and Santa has come and gone. May you have a joyfilled day with your families! Macaroni Angel made by my mom. These have suffered from attrition over the years. I think this is the only one we have left. 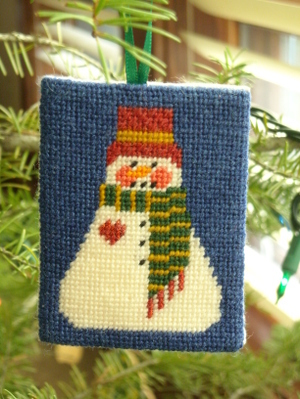 Needlepoint snowman I made several years ago. I finally got all the rest of them finished up this Christmas. Several people have gotten these as gift tags this year and Chloe and Ryan will get one too. This one is mine to keep! 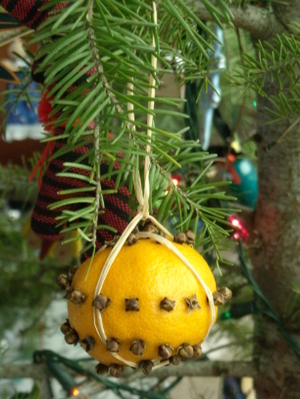 I made this orange and clove pomander at a homeschool gathering this month. 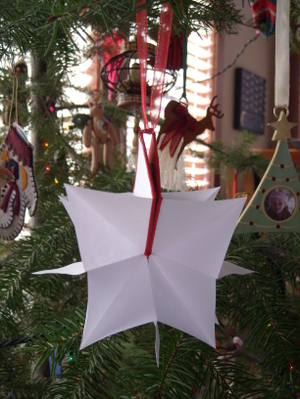 My sister made one of these for each of us last Christmas. 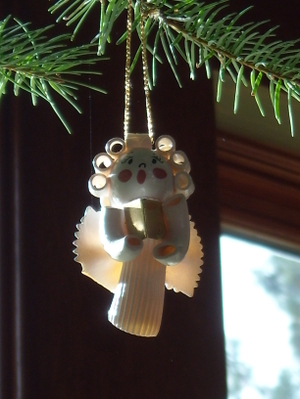 These are some of my favorite ornaments. They sparkle so prettily in the sun. Secret Christmas knitting continues here, but I thought I'd show you some of my favorite handmade ornaments in the meantime. 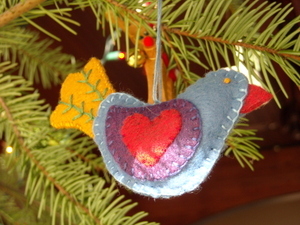 While our tree is not exclusively decorated in handmade ornaments, the ones made by hand by loved ones as well as skilled artisans are some of my favorites. Enjoy! 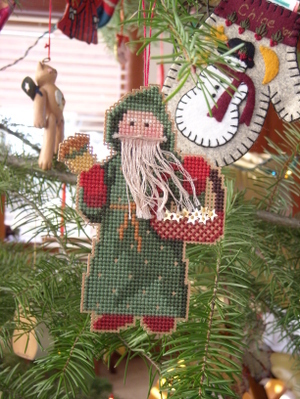 Cross stitched Santa on perforated paper, made by me. I've made a bunch of these and hope to show you more. The felt mitten was made by my mom. 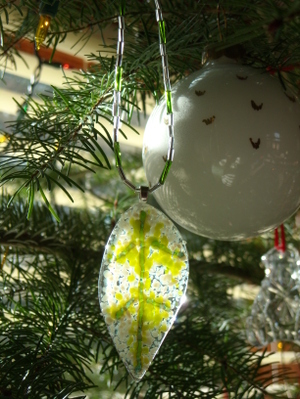 This hand blown glass ornament was made by the artisans at Holy City Art Glass in Los Gatos, CA. We lived in Los Gatos for many years and a holiday trip to watch the glass blowers was a highlight. You can read about Holy City's fascinating history here. 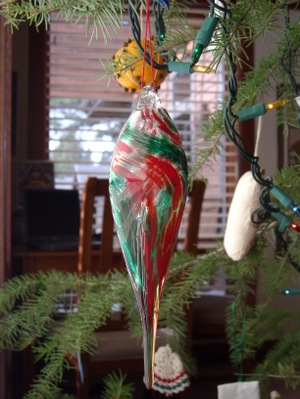 I made this candlewick ornament when I was in college, many moons ago. 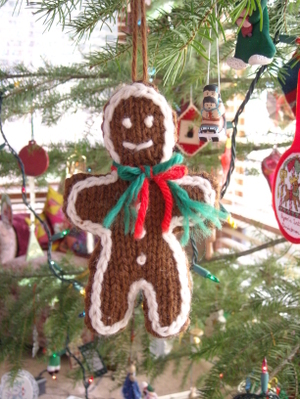 My mom made each of the kids one of these knitted gingerbread ornaments when they were little. 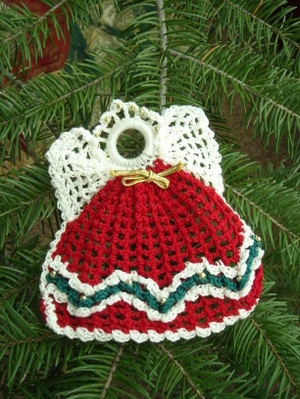 My mom has made many crocheted angels over the years, but these colorful ones are my favorites. There are also smaller ones. Maybe I'll get a photo of one of them too. 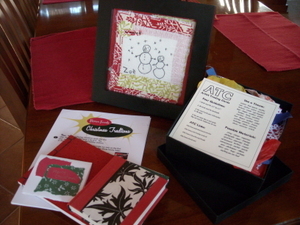 We are the very lucky recipients of the Holiday Traditions exchange from Alisa. I was overwhelmed when opening the box! I hope our box for Alisa didn't underwhelm her! Just look at the treasures we got. 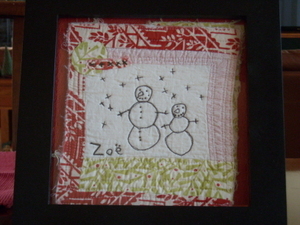 First of all the lovely framed stitched quilt square. Is that not the cutest! I want to know how she did it and how it's framed. Here's a closer look. 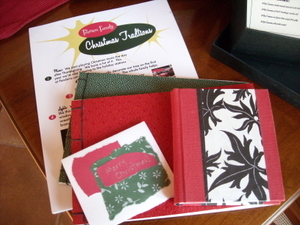 Alisa also sent these beautiful handmade journals and a great list of her family's holiday traditions. She sent an added bonus, a box of goodies for making Artist Trading Cards! 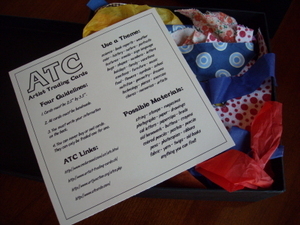 Chloe and I love to make ATC's and this will be a wonderful addition to our supplies. Thank you so much Alisa! This swap was really fun to do. I hope we can do it again next year! I seem to be making these a lot this Christmas. 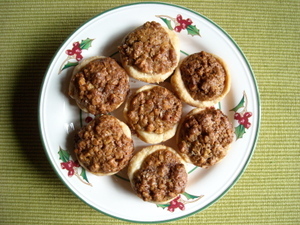 Pecan Tassies make a great gift and work very well for potlucks too. They taste like miniature pecan pies. For the dough, beat the butter and cream cheese together. Add the flour and mix well. Wrap and chill the dough for at least an hour or overnight. Shape the dough into 24 1" balls. Place the balls of dough into the cups of an ungreased mini muffin pan (there should be 24 cups). Shape them into tart shells by pushing the dough up the sides. If you have a tart shaper that will work well. You might also try rolling the dough out and cutting circles to place in the cups. I would guess 3" circles would work, but I've never done it that way. Combine the filling ingredients and fill the tart shells evenly. Bake at 350 degrees for 20-25 minutes. Cathi in particular asked for this recipe, but others have expressed an interest as well. My friend, Erin, who doesn't like corn syrup really loves these because they are made without it. My traditional pecan pie recipe does have corn syrup. I haven't tried it yet, but I've thought about making this into one large pecan tart. Oh, and if you need to feed a crowd, definitely double the recipe. These little babies go fast! I got the second pouch done. You might notice I forgot to cut the triangles off the corners. Oh well, it works just as well this way. The inside looks pretty much the same as the first. Each of the girls is getting one of these snowman ornaments. 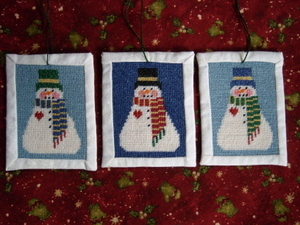 I stitched these years ago, but finally got around to finishing them a couple of days ago. 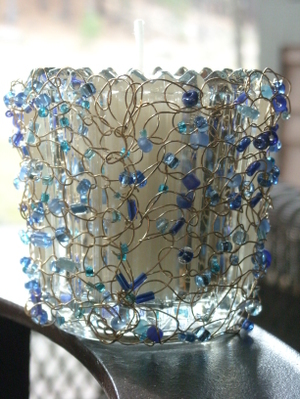 I also have knitted a few more votives for gifts. I really love this blue one which was my swap gift for my homeschool group's Mom's Night Out holiday party on Sunday. I'm still working away on a couple of super secret gifts. Last night I spent getting our Christmas cards made. Oh, they are so cute. Photos to come soon. Just thought you might enjoy some photos I took of Scrabble yesterday. 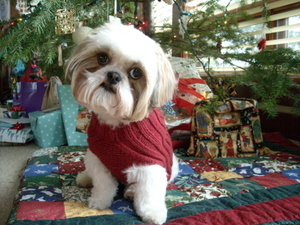 He's wearing the Penny sweater from Knitty. 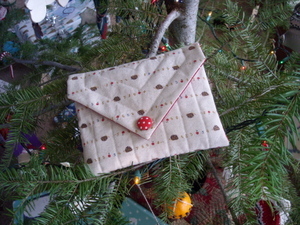 It's my own modification to make it in the round (don'tcha know I hate sewing up!). He's sitting on a quilt my mom made us for Christmas a few years ago. To the right is one of my drawstring gift bags. I made a few more the other day and had to go to Jo Ann's today to get some more ribbon for the drawstring. Anyone interested in a tutorial for such a thing? I don't know if my way is the most elegant, but it works for me and leaves no raw edges inside (is that the OCD in me coming out?). Someone also asked about the pattern for the Little Felted Stockings. I might do that as well, but I'm not sure when I'll get some time. I'll let you know! 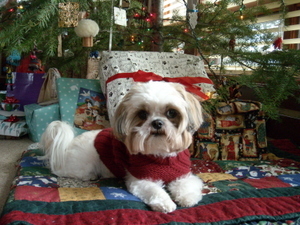 Scrabble wishes you a Very Merry Christmas and says, "Don't hate me for my long, luxurious eyelashes." 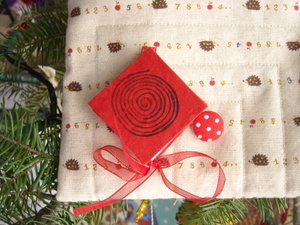 Here's a little twist on the envelope style gift bag. This time the gift bag is the gift. 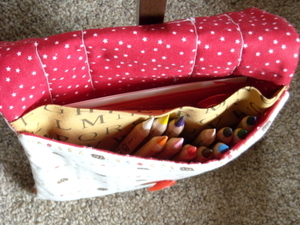 I've used some more of this adorable hedgehog fabric to make a pencil and book pouch for one of my neices. I'll be making another one for her sister too. See that extra pocket in there? 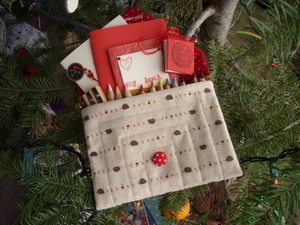 Behind the pocket is a little selection of handmade books, just right for a little girl who loves to draw. In front of the pocket I added a set of these lovely Lyra Ferby pencils and a pencil sharpener just the right size. This little book is a special one called a star book. I had lots of fun yesterday teaching kids in our homeschool group how to make these and then came home and spent the evening making more! Isn't that button just the cutest! Here's the star book in action. Thanks to Lazy Gal Tonya, I have a new style of gift bag to make. 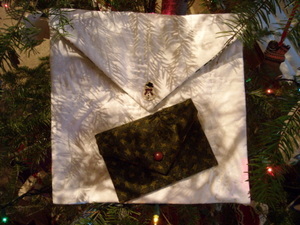 These envelope style bags are easy to make with this tutorial. There is some hand sewing involved, more if you decide to hand quilt them. 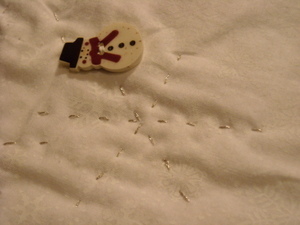 I hand quilted the snowflakes on the white one with metallic DMC embroidery floss and it was a real bear! The floss kept separating and getting caught on itself. I'll stick to regular floss or perle cotton next time. I machine quilted the little one and I have a few more in the works that may be machine quilted due to a lack of time more than anything else. You really ought to go and see the ones Tonya's made though, here, here, here and here. That last link also has some of her cool gift tags. 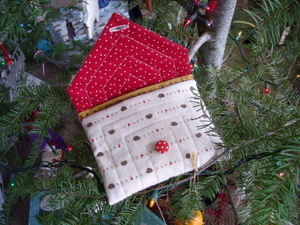 Tonya's bags are always so inventive (as is all her quilting) and she always hand quilts them. The chickadee one is funny because this was the first one I made with that fabric and I was so proud that I cut it correctly to make the chickadees upright on the outside of the bag. Well, I was totally wrong and they were upside down. The great thing with these bags is I could just make that fabric be the lining and then they were upright. I've got two more coming with the chickadees on the outside because I finally figured out how to do it right. I've got a lot of that chickadee fabric. 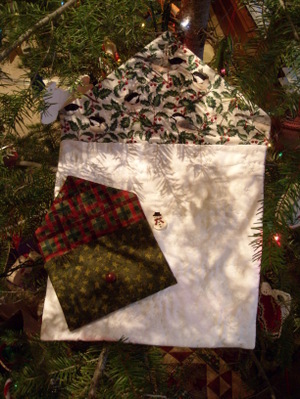 It's also on the back of the Christmas quilt at the bottom of this post. One feature of these bags I like is the hand sewn side seams. This is done with perle cotton in a simple whipstitch. 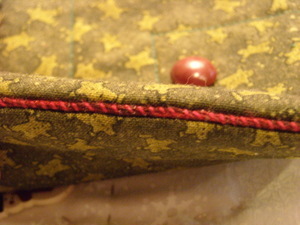 I sewed together the sides of the lining fabric so that you get a nice red line up the side. 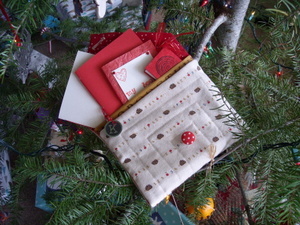 I have made other gift bags in the past and they are still being used. I do need to have more, so I've got these and may try to make my simple drawstring bags as well. 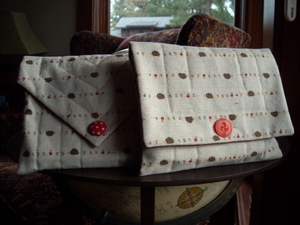 I also came up with a little twist on these bags and will show you that tomorrow!